If you’ve been following along with this little adventure then you’ll notice it’s been quite some time since the last post. If you’re just joining us you can check out part 1 and part 2 first. 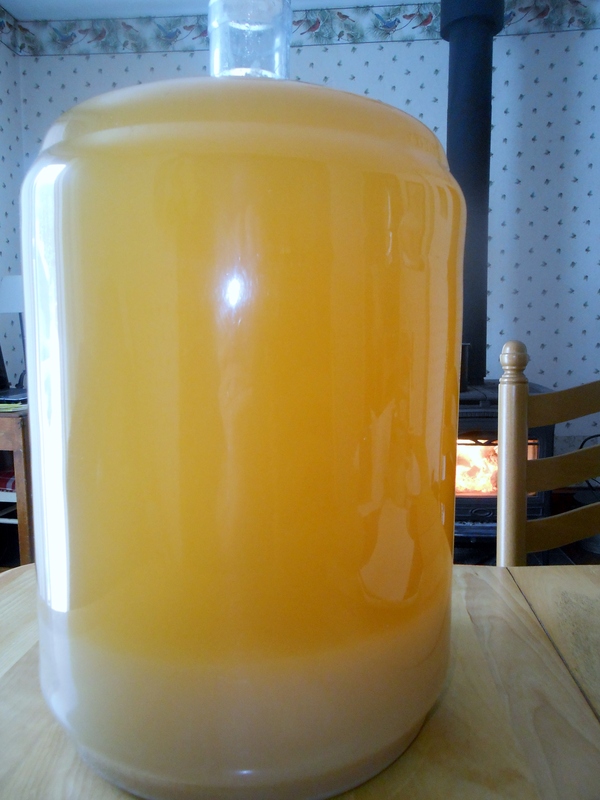 The wine has finished it’s secondary fermentation over the last two weeks and is ready for the next process: degassing. If this sounds like something you need after Thanksgiving dinner then you’d be close. All of the fermentation has produced millions of carbon-dioxide bubbles that remain suspended in the wine, and we’ll need to get rid of those to prevent corks from popping out or bottles breaking. The bubbles also help to suspend particles that we are trying to get out of the wine to clarify it. The “Wine Expert” kit we’re using has you mix all the sediment in the carboy back into suspension as you stir very vigorously. I use a special paddle with a long rod that attaches to a power drill. Before stirring I add a couple chemicals: potassium metabisulphite kills off the yeast to stop fermentation but also is a powerful antioxidant that prevents discoloration and spoilage, and potassium sorbate which is basically a preservative. These chemicals stabilize the wine to prevent further fermentation and get rid of harmful acids or bacteria. These are added to water first and then stirred into the wine. By stirring rapidly, all of the gas bubbles are released and the wine foams up just like soda poured into a glass. After stirring for a couple of minutes I add something called isinglass clarifier, which will clump together all of the solids suspended in the wine and make them drop to the bottom of the carboy. Then the wine gets more stirring until all the trapped CO2 bubbles escape. The last step is to put an airlock on the carboy and wait. It’s fun to watch the wine clear. First it’s all cloudy, then the cloudy layer slowly moves toward the bottom of the carboy over the course of about a week. When it gets to the bottom the wine is almost clear. After about two weeks the wine is totally clear but still has a nice color. The instructions tell you to bottle it from here but I like to transfer the wine into another container and leave the sediment behind. Next I’ll wait another week for any sediment to settle again before bottling. Due to some house guests that I had to attend to for the past three weeks I haven’t been able to blog at all. Plus I’ve been feeling a little depressed recently and usually when that happens I drop out of things and disconnect from other people. Things are looking better though, I had a great visit with my son when he came up for a week over school break. When I drove to Cape Cod to pick him up I also dropped off my two brother-in-laws. I get along pretty well with them but after a couple of weeks was happy to be driving them home. My fatal error was bringing the cable I have that connects an ipod to the car stereo. My brother-in-law hooked up his ipad and took control. He’s into, and I mean REALLY into, this reggae band called Midnite. They come from St. Croix, not Jamaica, so that immediately sends up red flags for this Reggae purist and aficionado. Have you heard of “jam” bands like Phish and the Greatful Dead? Well Midnite is basically a reggae jam band. Their songs are like ten minutes long. Supposedly they come out with three albums a year, so much for quality over quantity. My brother-in-law breathlessly exclaims that at the last show he went to in New York they played for four hours straight with only a short break. Uh, no thanks. I’ve never been into that kind of music, so I’m not faulting Midnite fans, it’s just not for me. In any case we all had to listen to how “Rasta to the bone” the lead singer was and other ramblings accompanied by some pretty generic and forgettable riddims. This was at a volume that surely voided any warrantee on the speaker system. I did get turned on to a Reggae artist from Guyana called Natural Black. He’s been around for a while but I never checked him out. He has a nice song called “Life be Same” on the Istanbul Riddim that you can watch on YouTube here. After that I got to pick up my son and enjoyed a couple of memorable road trips back and forth from the Cape with him. On these drives we got a chance to talk a little about random things that interest twelve-year-old boys. Part of the time was spent educating me* on the new music “gamers” are listening to. They call it DubStep, It sounds a lot like techno to me but I’m just not hip anymore. At least there are no annoying lyrics like you get from pop these days. My son is amused that I’ve become interested in DubStep, and I found out why after reading about it on Wikipedia. Apparently it originated in South London and is derived from “Drum and Bass” and Reggae Dancehall Dj styles. The emphasis is usually on the third beat, just like Reggae, and most DubStep songs include a “bass drop”, which is also employed in many Reggae riddims. My son hates Reggae, and it probably kills him that DubStep is related. It was sad bringing my son back to my ex’s house after a nice week together; but he had a lot of fun skiing, bowling (the only thing I can beat him at), shooting a shot gun, and exploring the woods with me. He’ll be back for more visits and I’ll get to see his hockey tournament in a couple of weeks too. Best wishes for a happy, healthy, and prosperous new year to all! * Playing his ipod through the car’s speaker system at decibel levels approaching a space shuttle launch. Charlie couldn’t believe the view from his balcony. A year ago he wouldn’t have imagined leaving his apartment, never mind honeymooning in one of the most glamorous hotels in Paris. He inhaled deeply, taking in the heady scent of the city stretched out below. 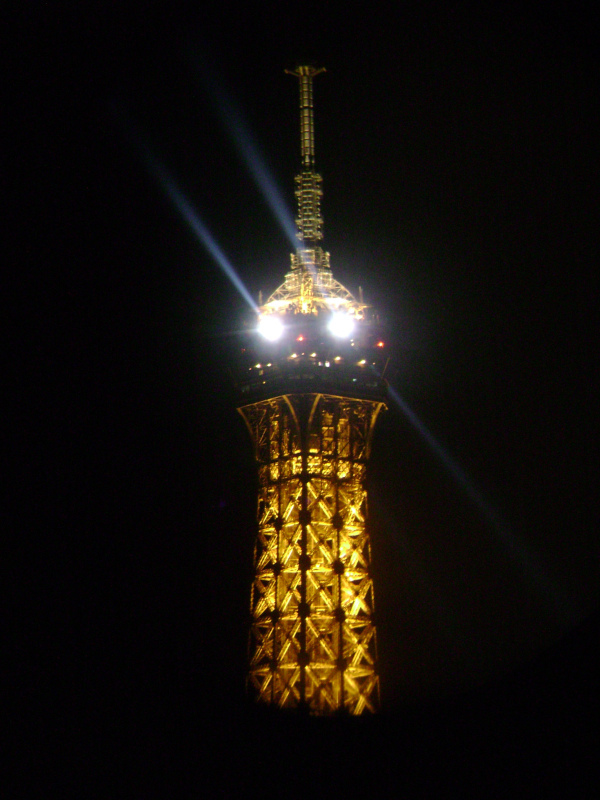 The Eiffel Tower glowed proudly just across the river Seine. With trembling hands he maneuvered his wheelchair back inside. The warmth of the room enveloped him. He heard her softly humming in the bathroom as he closed the embroidered silk curtains. The two of them had conquered his fear and self-hate together, victorious. Company For Christmas –Join the Party! If you find yourself alone on The Big Day, head over to Company for Christmas and chat (WordPress style) with us! Company for Christmas is a seasonal blog set up for folks that are isolated or can’t be with family or friends. A group of all-star bloggers will be moderating. Somehow I managed to sneak my way in. We’ll be talking about Christmas, community, blogging, relationships, and barbecued ribs. Basically it’s just a big ole party, and YOU’RE invited! Just click on that big C4C button on the right and join the fun. I’ll be moderating in the coveted early-morning slot from 8am (eastern standard time USA) till 10am, so make sure you drop by my page and show some love, I need the support of my peeps! My wife has a thing for “Charlie Brown” Christmas trees. 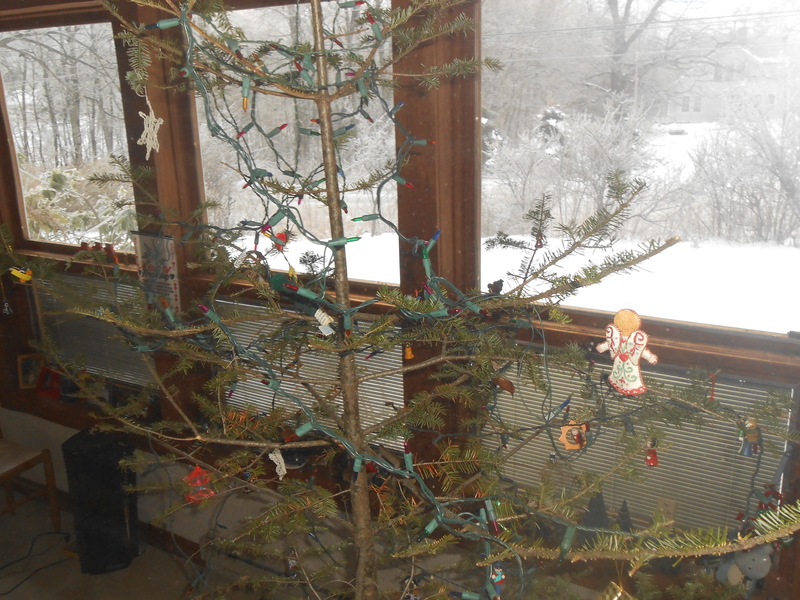 This year she insisted that we (I) cut down a tree from our back woodlot and bring it in. This was in the middle of an ice storm. “Can’t we just go up the street and buy the littlest and cheapest tree they have?” I asked. “Get your saw,” was her reply. So I trucked out to the woods, which was no small feat since there was a crust of ice over about a foot of snow. I kept falling through and my boots would get hung up on the ice so that I was constantly about to trip. I came across some big moose tracks, how do they stay warm and dry on a day like this? I located a beautiful fir tree that was about the right height. It was completely encased in ice. When I cut down the tree about half the needles came off. By the time I got it back to the house it was mostly sticks. The wife still wanted to put it up and decorate so in it came, still about half encrusted with ice. We had a nice puddle going where the presents are supposed to go. That’s the tree this year, anyone else have a soft spot for ugly trees? I have a professional grade luge course in my driveway. The temperature has been below freezing but somehow instead of snow, it has been raining. The entire house, deck, and yard is covered in ice. This is looking out the kitchen window at the lovely shrubbery. So I dumped a bag of rock salt on the driveway and started hacking away with a metal spade. 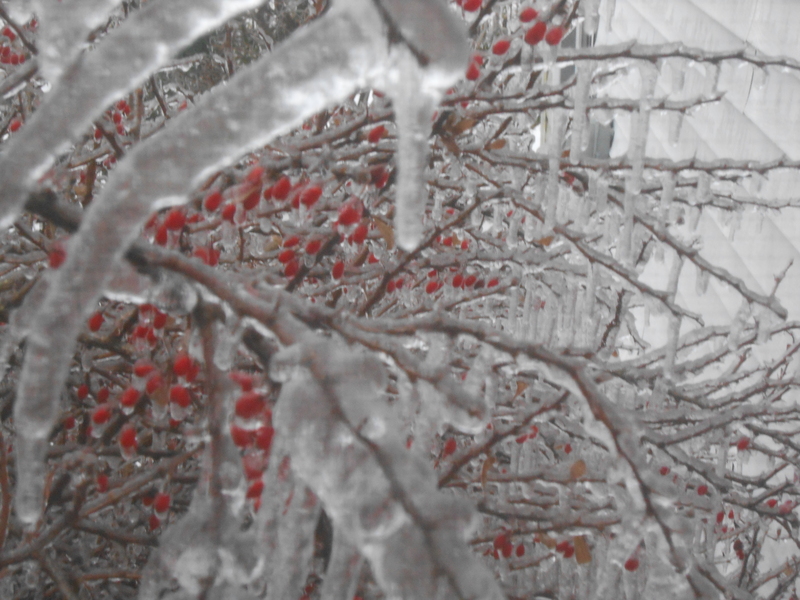 It was nice to be outside, and out in the woods I could hear branches snapping and giving way under the ice. After an hour of chopping the wife was able to drive up the hill and into the garage, success! Luckily the power is still on. Is anyone else out there covered in ice too? UPDATE: We lost the power about a half-hour after I posted this. Figures. I’ve been advised by my medical team that my Blog changes direction so often and so quickly that I should provide neck-braces! I can’t afford them, so I can only beg: please don’t sue me for whiplash. I am very poor! This is not love poetry, political spleen or ridiculous advice on writing, criminality or homelessness. This is my other arm (yes, I have unusual jumpers) known as Company for Christmas. I’m trying to do something lovely for people who will find themselves alone this Christmas. It requires no money and only a fraction of your time! It may even earn you some Blog traffic. You can help by simply reblogging this post. Job done. If you want, you can also read this post and offer advice, thoughts or even volunteer to help out. No matter what, it can be as little as ten minutes.